Here we have another hearty meal to prep and make Beef Stroganoff according to Wikipedia “Beef Stroganov is a Russian dish of sautéed pieces of beef served in a sauce with Smetana. From its origins in mid-19th-century Russia, it has become popular around the world, with considerable variation from the original recipe”. 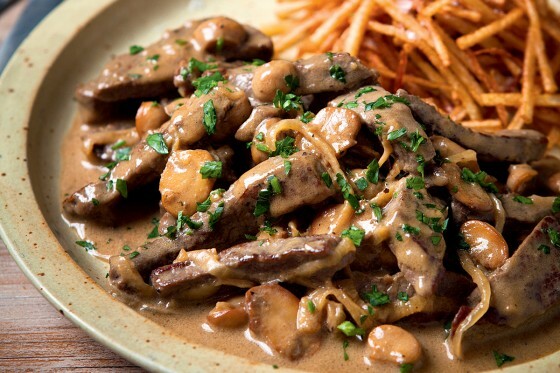 The name derived from a French-born Russian aristocrat, Pavel Alexandrovich Stroganov, whose cook, André Dupont, decided to name the recipe of his beef fricassee after the name of his employer. However several other versions exist as to how the recipe was invented. Thanks Wikipedia. Now as you know The Klutz is all about quick and easy therefore this recipe uses any and all shortcuts to make it so, therefore this was found on the Knorr website. 1 green pepper, sliced Due to the fact I’m not at all fond of green peppers. The Klutz has used a cup of peas instead. Fry beef strips and mushrooms in a splash of oil. Add onion, green pepper the peas and paprika and continue to fry until the onions are soft. Mix Knorr sachet contents with 500 ml cold milk and add this to the beef mixture. Bring to the boil, stirring often. Cover and simmer for 30 minutes or until beef is tender. Season with black pepper and sprinkle with chives.